Nationally, Black History Month celebrations are focusing on two anniversaries this year: the 150th anniversary of the Emancipation Proclamation and the 50th anniversary of the March on Washington. Upstate Medical University is honoring both anniversaries, and has added a third theme to our Black History events: an exploration of ways that our university’s core value of diversity impacts the communities we serve. A series of talks are being held on that theme. The Emancipation Proclamation — which declared the legal freedom of the three-million people living as slaves in the United States — took effect on Jan. 1, 1863. What was happening at Upstate and in Syracuse the year that the Emancipation Proclamation was issued? In 1863, the college of medicine was still located in Geneva, NY (It moved to Syracuse in 1871.) The Hospital of the Good Shepherd was a wood-frame house run by church ladies. Our first African American graduate, Sarah Loguen MD, was 13 years old and living in a home that was Syracuse’s main station of the underground railroad. Her mentor and future medical school professor, Major Michael D. Benedict MD, was a surgeon in the Civil War. There were eight medical students in the class of 1863, and the three-year medical degree cost $93. In the city of Syracuse, a 34-gun salute was fired on Jan. 3, 1863 by “the friends of Emancipation” who were “rejoicing over President Lincoln’s proclamation.” On Jan. 19, 1863, a meeting was held at the Weslyan Church to celebrate the Emancipation Proclamation. The Civil War raged on and throughout the year, African American men from Syracuse enlisted in the Union Army. “The First Step of Freedom,” a one-day exhibit featuring original drafts of landmark speeches. 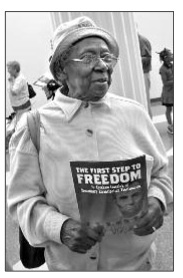 Greta waited in line to see an early draft of Lincoln’s Emancipation Proclamation and the draft of a speech by the Rev. Dr. Martin Luther King, Jr. written on the 100th anniversary of Lincoln’s Proclamation. Lincoln’s speech was handwritten, with notes from William Seward; King’s speech was typed, with his own handwritten editorial revisions. Photo by Susan Keeter. The Emancipation Proclamation has been on display in Syracuse twice: at the Everson Museum in 1976 and at the OnCenter in 2012. The March on Washington for Jobs and Freedom took place on Aug. 28, 1963. More than a quarter of a million people gathered and heard the Rev. Dr. Martin Luther King, Jr. deliver his “I have a Dream” speech at the Lincoln Monument. What was happening at Upstate and in Syracuse that year? At Upstate, there were two African American students in 1963. Medical student Frederick N. Ballantyne, president of the student council, graduated that year and went on to specialize in internal medicine and cardiology. He relocated to St. Vincent island and became medical director of Kingston General Hospital and assistant dean of the Kingston Medical College. A woman known only as Miss Jackson was a student in our College of Nursing, Class of 1965. (Upstate’s Historical Collections contain only her photo. We welcome additional information.) Upstate University Hospital was under construction (it opened in 1964), and our university had 176 medical students and 55 nursing students. In Syracuse, 300+ people packed into four buses to travel overnight to participate in the Aug. 28 March on Washington. The day before, 350 people staged a Syracuse March for Fair Housing, which was held in Columbus Circle and organized by CORE, the NAACP, the IUE Civil Rights Committee and the Women’s International League for Peace and Freedom. Mayor William F. Walsh proclaimed the day as “Jobs and Freedom Day” in Syracuse and Onondaga County. At 11:30 a.m. Wednesday, Feb. 6, Upstate will kick-off its 2013 Black History celebration by honoring two people who are dedicated to serving our community and deepening our appreciation of diversity: The Rev. Phil M. Turner and Geralyn Hall FNP. 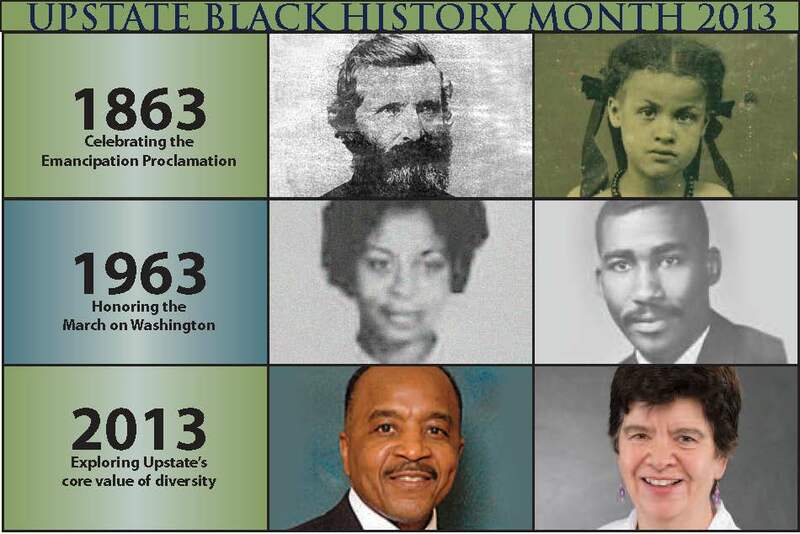 Look for more on these honorees and other Black History events at Upstate. The kick-off is at 11:30 a.m. Wednesday, Feb. 6 in the Campus Activities Building, 155 Elizabeth Blackwell St. The event is free and open to the public. The Liturgical Dancers will perform, Rev. Phil Turner will sing, Mozart Guerrier will read a poem, and Will “Chef Blue” Lewis will provide heart healthy soul food. 12:30 to 1:30 p.m. Wednesday, Feb. 13 — Walk the Talk Diversity Lecture, by Peter Blanck, PhD, professor and chair of the Burton Blatt Institute at Syracuse University, held in Weiskotten Hall room 2231, 766 Irving Ave.
3 p.m. Friday, Feb. 15 — Infant Mortality in the Black Community, by Onondaga County Health Commissioner Cynthia Morrow, MD, held in the Medical Alumni Auditorium on the first floor of Weiskotten Hall. Noon Wednesday, Feb. 20 — the Elizabeth Blackwell Day speaker is ophthalmologist Janine Clayton MD, director of research on women’s health and the associate director for research on women’s health at the National Institutes of Health. Her talk is titled, “Putting Science to Work for Women’s Health: The Next Generation.” The presentation is in the Medical Alumni Auditorium on the first floor of Weiskotten Hall, followed by a reception in the Setnor Atrium. Listen to an interview with award winner Geralyn Hall. Here are recipes and details about Chef Blue, who is catering the ceremony. This entry was posted in community, education, entertainment, history, medical student, nursing. Bookmark the permalink.